L: 64" x W: 18" x H: 37.5"
Retreat Bedroom Dresser This Retreat bedroom dresser is named perfectly—it’s reminiscent of gorgeous bedroom furniture you’d find in one of your favorite vacation getaways. Its captivating transitional design will adorn your space with its sleek brushed, nickel-finished hardware and eye-catching molding. Plus, you can’t go wrong with the white finish—it’ll work with any color scheme you can imagine! This Retreat bedroom dresser is named perfectly—it’s reminiscent of gorgeous bedroom furniture you’d find in one of your favorite vacation getaways. Its captivating transitional design will adorn your space with its sleek brushed, nickel-finished hardware and eye-catching molding. Plus, you can’t go wrong with the white finish—it’ll work with any color scheme you can imagine! Very pretty for my college girls' shared room. Nice size and great price. Only issue with delivery, smart alecky guys. Extremely well made dresser in white with handles that resemble shells which reminds you of the beach. Perfect size for my bedroom. Love the color, and especially loving the deep drawers. Plenty of space on the top, too! Recently purchased this Bedroom Set and Love it. Great Quality for the Money. Well Made, the color is more of a Cream off while color Looks very Upscale ! We are very happy with our new dresser. It arrived in perfect condition, delivery showed up 15 min early and making the purchase was quick and easy. I would recommend this product. Nice dresser. Quality good and a great price. Looks terrific in our master bedroom. Delivery guys were awesome! This is a great dresser that will last a long time. The color and finish is beautiful. The drawers are a good size and the straight lines are stunning! We bought this bedroom set for our guest room and it is perfect. The dresser is large enough to store all the guest room linens with room to spare. It has a slim profile so it fits nicely in our smallish room. The construction seems solid, the drawers work nicely and it looks great. Bought this dresser for use as a vanity in a bathroom. It is truly outstanding in every way. Stylish, well crafted, and functional. The folks at the Oakhurst - Ocean (NJ) store were terrific. Lisa (the salesperson) was very nice. She did not hover over you (can't stand that). She gave you your "space." When you needed assistance, she took care of everything. The delivery team was also a pleasure. Genuinely friendly and courteous. It looks beautiful and is constructed well I couldn’t be happier how it looks in her room it fit perfectly. Sales and delivery people were helpful and professional. I highly recommend this dresser, mirror and nightstand and Raymour & Flanagan . I tried to share a photo but couldn’t do it?? 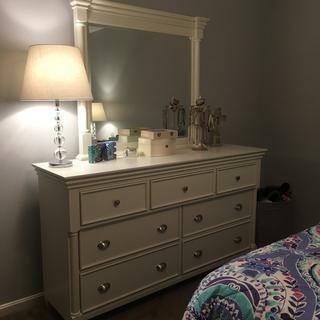 What color is this dresser; white or off-white? Also, what are the drawer dimensions? BEST ANSWER: The Retreat is going to be white. The top drawers on the left and right are 4" deep, 15" from left to right and 14" front to back. The center, top drawer is 4" deep, 20" left to right and 14" front to back. The bottom drawers are all 6" deep, 26 1/4" left to right and 12 3/4" front to back. Is the finish on the Retreat collect white or off white? Thanks! BEST ANSWER: The Retreat collection is a warm white finish rather than a stark white color. does this come assembled? If not, what are the dimensions of the box it is delivered in? BEST ANSWER: The top drawers on the left and right are 4" deep, 15" from left to right and 14" front to back. The center, top drawer is 4" deep, 20" left to right and 14" front to back. The bottom drawers are all 6" deep, 26 1/4" left to right and 12 3/4" front to back. The top drawers on the left and right are 4" deep, 15" from left to right and 14" front to back. The center, top drawer is 4" deep, 20" left to right and 14" front to back. The bottom drawers are all 6" deep, 26 1/4" left to right and 12 3/4" front to back. 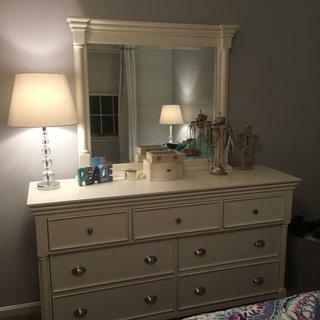 Is this white dresser the same "alabaster white" as the Somerset bedroom dresser? BEST ANSWER: The Retreat dresser is a little different color than the Somerset collection. The Retreat can be described as a flat "paper white." While it has the same slight shine to the finish, the Somerset looks like it has more of a slight "tan or sand" base to the white. do the drawers come out far when open or halfway like many? BEST ANSWER: The drawers will pull out more than halfway. Does this dresser come with a mirror, or do you have to buy your own? BEST ANSWER: Our Customer Care Department would be happy to provide you with cleaning instructions for the Retreat Bedroom Dresser.